You can expect to feel better and stronger each day, although you may need pain medicine for a week or two. You may get tired easily or have less energy than usual. This may last for several weeks after surgery. You will probably notice that your belly is swollen and puffy. This is common. The swelling will take several weeks to go down. It may take about 4 to 6 weeks to fully recover. It is important to avoid lifting while you are recovering so that you can heal. Avoid lifting anything that would make you strain. This may include a child, heavy grocery bags and milk containers, a heavy briefcase or backpack, cat litter or dog food bags, or a vacuum cleaner. Avoid strenuous activities, such as biking, jogging, weight lifting, or aerobic exercise, until your doctor says it is okay. You may shower. Pat the cut (incision) dry. Do not take a bath for the first 2 weeks, or until your doctor tells you it is okay. You will probably need to take 2 to 4 weeks off from work. It depends on the type of work you do and how you feel. If you have strips of tape on the cut (incision) the doctor made, leave the tape on for a week or until it falls off. Or follow your doctor's instructions for removing the tape. 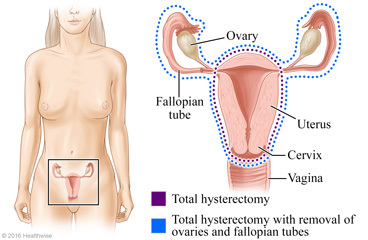 Enter M280 in the search box to learn more about "Abdominal Hysterectomy: What to Expect at Home".